Charisea saxicola is common, but small and cryptic species. It is distributed in North Pacific: Alaska, Aleutian Islands, Commander Islands and from Kamchatka to Hokkaido. 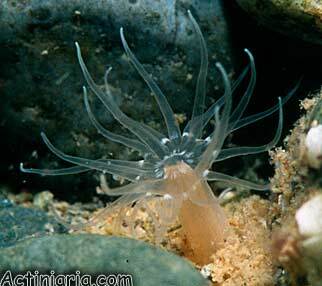 This species has elongated cylindrical body about 0.5cm width and up to 3-7cm long. The body is smooth, translucent, beige colored. The species occurs in sandy substratum, between stones with the pedal disk always attached to hard buried objects (stones) so only the upper portion of column and the oral disk with the tentacles (up to 40 in larger specimens) are visible on the surface. SANAMYAN, N., K.SANAMYAN, 1998. 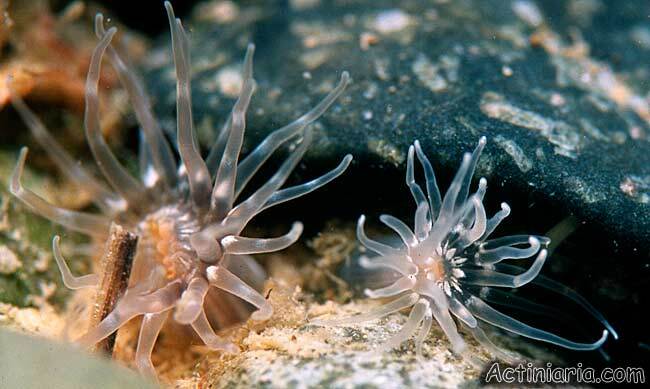 Some Actiniaria from the Commander Islands (Cnidaria: Anthozoa). Zoosystematica Rossica, 7(1): 1-8.